This Monday evening Lazio welcome Inter at the Stadio Olimpico in Rome, a team that has only 1 point more than them right now. Lazio and Inter are on the 3rd and 4th place on Serie A table respectively, which shows that both teams have been playing very well this season. Predicting the outcome of this match isn’t gonna be easy, but I’ll do my best in the Lazio vs Inter match preview, at the end of which a couple of betting tips await you. 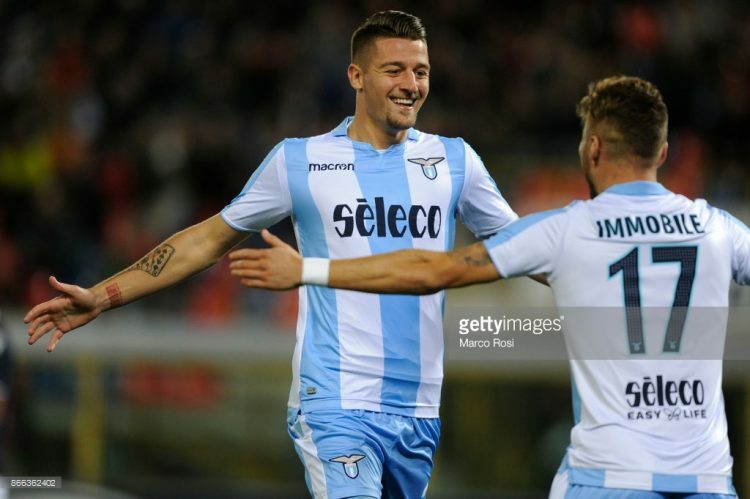 After losing the Rome Derby against AS Roma, followed by a defeat in the Europa League to Eintracht, many people thought that Lazio’s good run has come to an end. But, then they beat Fiorentina and Parma in Serie A, before defeating Marseille in Europa League in an away match last Thursday. The good performances in those three games have certainly given these players a lot of confidence. And considering that all of them are playing at a very high level, Inter do have a lot to be afraid of. Their best scorer has been Ciro Immobile, but he’s far from being the only in-form player this season. In fact, there are several players who can be called the best Lazio player. What’s got to worry them a bit is that it’s been more than two years since they beat Inter the last time in Serie A. But on the bright side, Lazio are playing in front of their own crowd, where they’ve won every single game since August. Inter lost to Messi-less Barcelona last Wednesday, which showed that they still aren’t up to the challenge in the Champions League. But, in the Italian Serie A, they could be the dark horse that could ruin Juve’s plans. Unfortunately, Inter blew their chances in the early part of the season, failing to win some games they really should’ve won, e.g. Parma game, Sassuolo game, etc. They’re now trailing 6 points behind Juve, which isn’t much, but Inter are yet to play against the current Seri A champions. And they’re also to play many top-ranking teams in the league, Lazio included. So, do they have what it takes to hope for points in Rome? Well, I think they’re the better team of the two, but anything can happen in big matches like these. Their best player Mauro Icardi appears to me like a player who can score against any team on the planet. It’s up to his teammates to feed him useful passes. And that’s exactly what might be a problem against Lazio. As the team from the Italian capital is famously strong in the center of the pitch, Inter probably won’t be able to create too many goal chances. I think this is going to be a close one. We’re bound to see a big battle in the middle of the pitch, so who wins it, will win this war. But, then again, maybe it’ll be a stalemate. A draw actually seems like the most probable option. Still, if you want something even more sure, then bet on goals. We shouldn’t see too many of them.